The wonderful staff, students, and parents that I have met within Davie County Schools who give their all to focus on our mission, and who support each other through successes and struggles. The inspiring teachers who work countless hours to ensure they are thoughtfully and skillfully prepared, and who deliver engaging activities every day for our students. Our incredible support staff who are dedicated to supporting our teachers in every classroom and caring for the children we serve. The tireless efforts of our maintenance, transportation, and child nutrition staff to create and maintain a safe, clean, and rich learning environment so that our children may learn without distractions. The thousands of hours of administrative tasks that are accomplished every day to support our students and staff: from accounting, to purchasing, to payroll and benefits, to technology support, to curriculum and instructional support, to human resources and student support services. The visionary administrators and Board of Education who constantly communicate and develop strategies of continuous improvement and provide direction for our district. The opportunity to live in America and serve with you in the public schools of Davie County where every child, regardless of their circumstance, is welcome in our schools. I am grateful for each and every one of you and am fortunate to have the opportunity to work with you to serve the children in our community. Together, we work for a purpose much greater than ourselves and one that will have an impact on many generations. 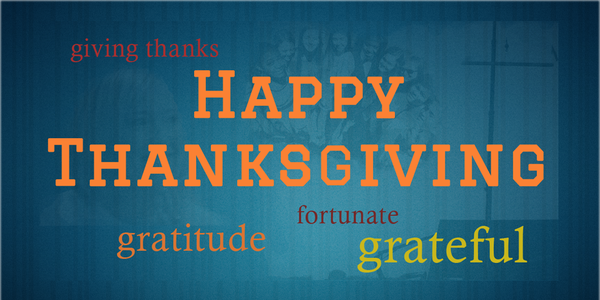 I wish you and your families a Happy Thanksgiving!